Which approach to new product development will produce better results? Reductionism or Recursion? One of the potential advantages of reductionism is that it may provide focus to specialty efforts. Another potential advantage is that is may facilitate the interchangeability of resources (for example, one tester can be replaced by another tester with the equivalent qualifications). Acceptance of a hand-off mentality. This occurs when one functional area ‘finishes their job’ and presents their deliverables to the next group. Sub-optimization. Too much effort may be devoted to certain tasks while others items do not receive sufficient attention. Too much emphasis attributed to reaching milestones. Not enough emphasis on value creation. Solving a customer’s problem. This is also described as providing a solution for the job the customer is trying to accomplish. Are their current efforts improving the ability of a customer to solve their problem? Has the learning increased so that individual contributors can determine if they are closer to solving the customer’s problem today than they were yesterday? Are these efforts valuable to the customer? Are these efforts too bureaucratic? Will the development efforts for the next project produce better results than the current project? Are the development capabilities being enhanced for future projects? Will the contributors to the development network feel a sense of accomplishment? Will the predominant feelings relate to burn-out and frustration? An environment that enables recursion to flourish ensures that individuals embrace opportunities to contribute to value creation during the current project and future projects. From the book “Agile Game Development with Scrum” by Clinton Keith (@ClintonKeith) page 227. Published in 2010. Iteration is repeating. Often, it involves executing the same process with new items from a long list of potential tasks. In Scrum, Sprint is the term for an iteration. In Scrum, the duration of a typical Sprint is in the range of one to four weeks. During a Sprint, development is devoted to completing selected items from a backlog of items. Common metrics for a series of Sprints may highlight factors related to the speed of execution. This may include items such as burn-down rate. One of the potential problems with an iteration mindset is that the number of product features that are completed is associated with a proxy for the value produced by the project. Which approach provides better value from a project? Is it a reductionist approach or a recursion approach? A tyrannical approach does not produce better project value. Debating over a development question that includes the word ‘or’ is not likely to improve qualities such as autonomy, mastery, and purpose. Better value will be produced with the proper combination of reductionism and recursion. Some individuals excel as reductionists. However, the potential for project success can not be achieved when the reductionist viewpoint is the only viewpoint that is tolerated. Maximizing the potential for project success requires that one or more of the primary problems is being solved. Solving these primary problems is best accomplished with the inclusion of a recursion approach. This requires more than assigning someone to a role such as Product Owner. I have found that that potential to maximize success in new product development improves when there is a critical mass of individual contributors that embrace a recursive approach to development. This diversity in the development network improves the potential for harmonious plans, decisions, and actions throughout development. It improves the potential for the self-correcting analysis of feedback. The interplay of reductionism and recursion is similar to the interplay of vision and version in new product development. These approaches facilitate implicit coordination within a diverse group of individual contributors throughout development that will produce better outcomes than alternatives that enforce handoffs and explicit coordination during development. With a synergistic approach, the customer’s problem is more likely to be solved. 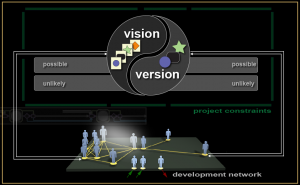 The Development Experience [DX] of the individual contributors is more likely to improve from one project to the next.